Welcome to the best candy paint value on the market! Based on dyes and ultra transparent pigments these finishes offer stunning effects that are only available in true candy paints. 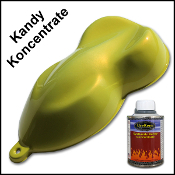 We are the only manufacturer that offers candy in 4 chemistry types to suit a wider range of applications. Scroll to the bottom of this page to learn more about which type of candy is best for your application. 2K Urethane Candys are the deepest, wettest candy finish. They stay wet like clear and are typically very glossy even before clear is applied. 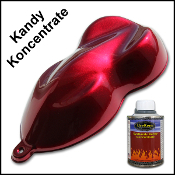 2K Urethane Candys must be applied over a metallic or pearl base to have a sparkle effect. Coarse metallics such as our stellar silver is the most popular option. Changing the base color will alter the final color. The EKB series is made with the colors as our 2K Urethane Candy, however, they dry and tape more like basecoat. These are an excellent choice for graphics where you want the rich candy look but need them to dry to tape faster and have less edge build for cleaner tape lines. Like the EKU 2K urethane candys these must be applied over a metallic or pearl color for a sparkling effect. Again, silver is the most popular but any of our metallic or pearl basecoats can be used under the EKB series. Our Kandy graphic colors are like the candy basecoat but they have pearl in them to provide the sparkle effect. 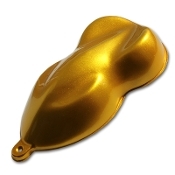 Therefore, they do not have to be applied over a metallic or pearl finish to get a beautiful sparkling candy appearance. Most painters use them over either black or white sealer but can be applied over any of our base or sealer colors. Having pearl in the color also makes this series of color easier to apply and blend repair damages. Because it is built from basecoat chemistry this series also dries and tapes clean and quick for easier graphics. Candy concentrates are additives of concentrated candy colorant designed for tinting candys and basecoat colors for unique colors with rich candy effect.